The most comfortable and long lasting garden, pool or verandah furniture available in Australia! At Binglebar we specialise in Adirondack chairs and furniture made from 100% solid HDPE plastic sourced from within Australia. This ensures that our furniture will last for many, many years and will never need maintenance or painting. Our HDPE chairs have many advantages over timber, including the fact that they are unaffected by rain, snow, salt or chlorine, making them perfect for use by the pool or your coastal retreat. They are also at least as heavy and solid as most timber Adirondack chairs so they are unlikely be blown around by even the strongest wind. Adirondack chairs and furniture with charm, comfort and longevity. Adirondack chairs have been increasingly popular in many countries around the world, including Australia, for over 100 years. Also known as Westport chairs, in Canada the same style of chairs are called Cape Cod chairs, whilst in South Africa they are called Muskoka chairs. Recently the concept has been greatly improved upon with the development of HDPE plastic Adirondack furniture. We believe our range of furniture takes full advantage of the potential of this incredible material. Please click on the button below if you would like more information on the advantages of HDPE over timber furniture. In response to huge popular demand, Binglebar is proud to be able to add our new beautifully designed HDPE sun lounge to our small range of outdoor furniture. Designed to complement our existing range of Adirondack furniture rather than actually being Adirondack in style, our new sun lounges can blend beautifully with your existing Adirondack furniture or as a superb piece of stand-alone pool furniture. 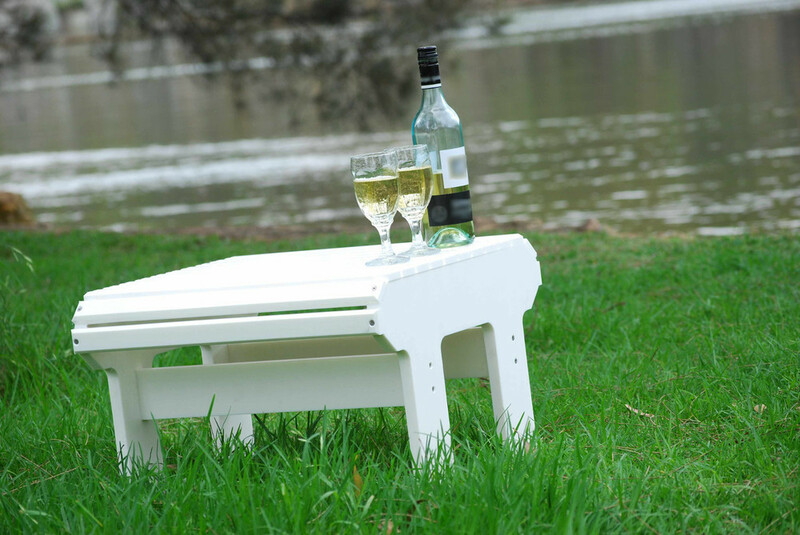 They share all of the many advantages of the rest of our HDPE range of furniture, including the fact that they are unaffected by rain, snow, salt or chlorine and the HDPE plastic we use will last many years longer than most other materials and is UV treated to counter the effects of Australia’s hot sun. With our four-position back rest it would be almost impossible not to find the perfect level of comfort just for you. The design includes a slide out table accessible from both sides, and the backrest can lay completely flat, easily converting the lounge into a bench seat. Be quick and order now, we have limited stock and they are sure to go fast!! Our Adirondack chairs are super comfortable and last forever! Settings of our furniture are available in any combination of chairs, footstools and side tables at a lower cost than if each component was purchased separately. As an example, the above setting consisting of two HDPE Adirondack chairs, one matching side table and one matching footstool, sells for only $1,259. Please click on the button below to view the costs of some of the numerous possible setting combinations. Our traditional Adirondack footstools have been especially made to complement the comfort and good looks of our Adirondack chairs. They add that little bit of extra comfort when enjoying that well earned drink on the verandah or just stretching out by the pool. Just like our Adirondack chairs, our footstools are made from hard wearing, durable, maintenance free HDPE plastic. Traditional design and comfort with the added advantages of long lasting, maintenance free HDPE plastic. Sturdy, comfortable and beautifully designed. Especially made to complement our Adirondack chairs, our side tables also share all the benefits of HDPE plastic. Not only do these tables look good, they are extremely versatile as well. They can double as a footstool and, because they are very sturdy, can even double as a spare seat.